Chewable Vita C - essential for a healthy immune system. Take extra at the onset of a cold or virus. Optiflora (probiotic) - Essentail for any child who's ever been on an antibiotic..restores essential flora where 80% of the immune system resides. Nutriferon - Yet another recent clinical study from Cornell Medical School proves its effectiveness against flu viruses. Immune support at the cellular level. Defend & Resist Complex - Echinacea plus herbs increase activity of white blood cells to gobble up viruses and bacteria. Alfalfa Complex - natural decongestant; excellent for children reluctant to eat vegetables. Avoid (or minimize) SUGAR & baked goods - we know this is tough, but is seriously damaging to the immune system & especially the brain. Sugar and white flour are called the anti-nutrients becasue they deplete B vitamins & other essential nutrients. Wishing you and your family a happy & healthy fall and winter! America is in the midst of a serious antibacterial craze. From soap and toothpaste to playing cards and kitchenware, it’s a challenge to find a product that isn’t currently available in an antibacterial version. The majority of these products rely on an antibacterial agent called triclosan to make them hyper-hygienic. Though it may seem wise to abolish germs at every turn, according to experts, surrounding your family with antibacterial everything is not actually a good idea. For one thing, living in an ultra-sanitized environment may ironically be quite unhealthy. A theory called the Hygiene Hypothesis says that when our bodies cease encountering a lot of bacteria and viruses in daily life, our immune systems stop getting the workout they need to stay in proper shape. When that happens we face an increased risk of allergies, asthma, and other illnesses. Clearly triclosan is not a pesticide we want in our homes, around our children, or in our bodies. It’s also not one anyone needs in order to practice good hygiene. Studies have shown that simple handwashing with ordinary soap is just as effective at removing bacteria as using an antibacterial soap. Many groups, including the American Medical Association and Physicians for Social Responsibility, have come out against the use of triclosan. To keep triclosan out of your home, avoid the use of anything labeled antibacterial. Read claims on everything from socks to personal care products to toddler training potties to cleaning products. Skip any that contain triclosan or claim that they are antibacterial or odor fighting. Still concerned about germs? Teach your kids to frequently and properly wash their hands. After soaping up with warm water, they should rub enthusiastically for 20 seconds, paying attention to their fingernails, wrists, and spaces between fingers. That will keep them healthier at school, day care, and other places where germs congregate. One study found that frequent handwashing results in 45 percent fewer cases of respiratory ailments, no pesticide needed. We all know that water is important, but do you know just how beneficial drinking water can be? Water has been shown to help out when it comes to weight loss, fatigue, hunger, headaches, skin issues such as acne….and so much more. Our bodies are made up of mostly water — 70% of our brain and nearly 90% of our lungs, for example — so it is no wonder they need replenishing all day long. Water First. Instead of grabbing your usual soda or a Cup of Joe, look to water as your regular beverage of choice. Top Of The Morning. Make it a habit to hydrate first thing in the morning when you wake up. Keep a glass of water right by your bedside so it is the first thing you think of as you start your day. AHW…Always Have Water. Be sure to always have water with you or have access to it at work, when you are driving, while running errands and elsewhere. A good rule of thumb: Some experts recommend taking your body weight and dividing it by two to get a baseline amount of how much water you need each day. If you live in a hot climate, drink diuretics such as coffee or exercise daily, be sure to add in more H2O! For more Health and Wellness Tips, be sure to “Like” us on Facebook! 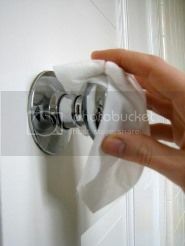 Most people know that cold and flu viruses can contaminate doorknobs, faucets and other surfaces. But for how long? For example, cold and flu viruses survive longer on inanimate surfaces that are nonporous, like metal, plastic and wood, and less on porous surfaces, like clothing, paper and tissue. Most flu viruses can live one to two days on nonporous surfaces, and 8 to 12 hours on porous surfaces. But a 2006 study found that avian influenza seemed particularly hardy, surviving as long as six days on some surfaces. Cold viruses, however, deteriorate quickly. A study in 2007 found that when objects in a hotel room - light switches, telephones - were contaminated with a cold virus, 60 percent of healthy volunteers picked up the virus when they touched one of the objects an hour later. Eighteen hours later, the transmission rate was cut in half. On skin, cold and flu viruses generally last less than a few minutes, but that can be plenty of time: studies show that most people touch their hands or mouth several times in the course of daily activities - enough to cause infection. THE BOTTOM LINE Flu viruses tend to survive longer than cold viruses. If you are looking for a a good disinfecting wipe, take a look at Germ Off Fragrance Free Disinfecting Wipes. Kills odor-causing bacteria* found on hard,non-porous household, kitchen, and bathroom surfaces. Great for cleaning around the toilet. Leaves your bathroom and kitchen fresh and clean. The smart way to clean and disinfect. coli(ATCC*11229), and Escherichia Coli 0157:H7(ATCC*43895). Kills odor-causing bacteria* found on hard,non-porous household, kitchen, and bathroom surfaces. Great for cleaning around the toilet. Leaves your bathroom and kitchen fresh and clean. The smart way to clean and disinfect. *Kills 99.9% of Salmonella choleraesuis(ATCC*10708), Escherichia coli(ATCC*11229), and Escherichia Coli 0157:H7(ATCC*43895). Studies have found that the survival time for both kinds of viruses varies greatly, from a few seconds to 48 hours. The reasons have to do with a number of factors, including the type of surface, humidity and temperature. You Can't Believe Everything the Ads Say! I am often leery of the products I see advertised on TV for kids. One of them I have seen a lot lately is for PediaSure. So I decided to check the ingredients list and nutrition label. It was at that point that I asked myself, why would anyone give this stuff to their kids? Answer: Because advertisers do a great job of marketing. Water, Sugar, Corn Maltodextrin, Milk Protein Concentrate, High Oleic Safflower Oil, Canola Oil, Whey Protein Concentrate. Less than 0.5% of the Following: Soy Protein Isolate, Short-Chain Fructooligosaccharides, Cellulose Gel, Magnesium Phosphate, Natural & Artificial Flavor, Potassium Chloride, Potassium Citrate, Calcium Phosphate, Calcium Carbonate, Potassium Phosphate, Tuna Oil, Salt, Cellulose Gum, Choline Chloride, Ascorbic Acid, Soy Lecithin, Monoglycerides, Potassium Hydroxide, m-Inositol, Carrageenan, Taurine, Ferrous Sulfate, dl-Alpha-Tocopheryl Acetate, L-Carnitine, Zinc Sulfate, Calcium Pantothenate, Niacinamide, FD&C Red #3, Manganese Sulfate, Thiamine Chloride Hydrochloride, Pyridoxine Hydrochloride, Riboflavin, Lutein, Cupric Sulfate, Vitamin A Palmitate, Folic Acid, Chromium Chloride, Biotin, Sodium Selenate, Sodium Molybdate, Potassium Iodide, Phylloquinone, Vitamin D3, and Cyanocobalamin. Whew! Notice the artificial flavors, FD&C Red #3 (food dye), and dl-Alpha-Tocopheryl (synthetic Vitamin E). Since I am not an expert at reading food labels, I can only assume that if the Vitamin E is synthetic, so are the other vitamins. This list is enough for me to know that I would never feed Pediasure to my grandchildren. Fortunately, I have found an excellent meal supplement. 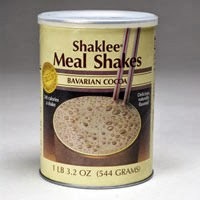 It's called Meal Shake and it's from Shaklee. You won't find artificial flavors, dyes or synthetic vitamins in this product. It comes in Vanilla and Bavarian Cocoa (very yummy) flavors. I gave it to my boys when they needed extra calories during their sports seasons. It's also excellent for picky eaters, providing 19 essential vitamins and minerals. By now I am sure you get my point. I just want us all to be smart shoppers, especially when it comes to making safe & healthy choices for our kids! By: Dr. Stephen Chaney, PhD. Many of you have been asking me "What is lactoferrin and why did Shaklee add it to Incredivites, their new Children's multivitamin? Simply put, lactoferrin is an iron-containing protein found in mother's milk that is very important in developing and strengthening the infant's immune system. 1) Iron is an absolutely essential nutrient for your child's immune system. In fact, a weakened immune system is one of the first signs of an iron deficiency. It turns out that lactoferrin is an easily absorbed form of iron. In fact there is a special transport system in the intestine for lactoferrin. Because the iron in lactoferrin is much more bioavailable than other forms of iron, the lactoferrin in Incredivites assures that your child's immune system gets the iron that it needs to function optimally. 2) Lactoferrin also increases the number of nutrient- absorbing cells in the intestine, so it enhances the absorption of the other nutrients your child needs for a healthy immune system. 3) Finally, lactoferrin suppresses the growth of bad bacteria in your child's intestine. That's important because 80% of your immune system originates in the intestine. Simply put, when those immune cells in the intestine have to spend their time fighting off bad bacteria in the intestine, they are unavailable to fight off bacteria and viruses elsewhere in the body. 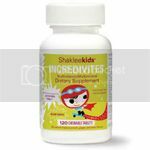 So lactoferrin helps strengthen your kid's immune system in several different ways and Shaklee's Incredivites is the first children's multi to contain this important immune-enhancing ingredient. (Q):If lactoferrin is only found in mother's milk is it really needed by anyone beside infants? (A): Lactoferrin is, indeed, very important in helping infants develop a healthy immune system. I suppose in an ideal world once the immune system was developed we wouldn't have to worry about it again. But we don't live in an ideal world. We live in a world of Happy Meals, french fries & soft drinks. We live in a world of artificially colored, flavored & preserved snack foods. We live in a world where antibiotics are used at the drop of hat! Several clinical studies have shown that lactoferrin can play an important role in strengthening the immune systems of children who are no longer breast feeding. (Q): My child is allergic to milk. Can he use a supplement containing lactoferrin? (A): Most milk allergies are caused by an allergy to whey protein, the most abundant milk protein, or lactose, the most abundant milk sugar. Lactoferrin, on the other hand, is a very minor component of milk, and it is very unlikely that your child will be allergic to lactoferrin. However, if your child has a very severe milk allergy, it is always a good idea to check with your pediatrician before giving them any food containing an ingredient derived from milk. How Friendly Are Your Bacteria? When we are born, our gut is pure - free of any bad bacteria - like a garden free of weeds. But as we grow and are exposed to “life,” a lot of the good bacteria is replaced with bad stuff. Like an untended garden where the weeds take over, bad bacteria can take over in our intestines, creating all sorts of problems. Where do the bad guys come from? As you mature, you're faced with many threats to the beneficial bacteria in your gut... from chlorinated drinking water... to overly-processed foods; antibiotics, steroids, birth control, chemotherapy, diabetes, stress, low thyroid and much more. As these enemies infiltrate the gut, they destroy the good bacteria and can result in many health challenges. Beneficial bacteria are necessary to re-establish or rebalance intestinal microflora. This is where probiotics can have a profound effect... not just on your GI health, but on your overall health as well. Since 70% of our immune system lives in the gut, it behooves us to be sure that we are keeping a healthy supply of the good guys in there. What do friendly bacteria do for us? First of all, they keep our immune system strong. They also are helpful for yeast infections, infections of any type, immune issues, digestive issues, bowel health (constipation/diarrhea, IBS, Crohn’s), skin issues and much more. They should also be taken along with &/or after antibiotics to replenish “good” bacteria destroyed by the antibiotics. Where do we get beneficial bacteria? I am sure you have heard the term “probiotics”. It seems to be all the buzz these days. The term probiotic literally means "good for life." Probiotics are live microorganisms that are similar to beneficial microorganisms found in the human gut. They are the “friendly bacteria” or “good bacteria” that benefit the colon and therefore the immune system. They are produced for human consumption most often in dairy products containing two types of microbes, lactobacilli and bifidobacteria. More recently, probiotic dietary supplements are becoming popular as a way to balance and promote a healthy digestive system. However, there are a few things to be aware of when talking about adding probiotics to your diet. There are a lot of ads on TV promoting the use of probiotics in such products as Activia, or the supplement TruBiotics touted by Erin Andrews. In fact there are many products on the market that contain good bacteria. However, in the case of yogurt for example, you would have to eat a lot of it to see any benefit. At the TruBiotics web site, it says that they “assure the number of probiotic bacteria are live and active up to the product expiration date, so you know how many good bacteria you’re putting in your body with every capsule.” It sounds good, but they really have no idea how many are still alive when the product is consumed or how many actually make it to the colon; moreover, while we know probiotics absolutely have nutritional value, what you see on the label may NOT be what you get. In fact, two researchers at Bastyr University in Washington recently tested a wide variety of probiotic supplements and found that in four out of twenty products no sign of living friendly bacteria was present. The unfortunate truth is that too many probiotic supplements vary widely in quality and potency and cannot survive harsh stomach acid in order to get to your intestines. The key to an optimal probiotic formula is through science-backed research by a qualified non-biased laboratory... and through a manufacturer with rigorous high-quality process standards in place. The most important fact is that when you consume probiotics in a form that is not protected from the hydrochloric acid and digestive enzyme pepsin of the stomach, such as in yogurts or non-enteric coated capsules, as much as 90% of the probiotic is destroyed. But, do not despair! There are some good probiotic products out there. And I am not saying that you shouldn’t eat yogurt. But I believe supplementation with a good-quality probiotic is the best way to ensure that you are getting enough of the good guys to make a difference. Look for a company that uses science-backed research, conducts their own quality tests and has a product that is properly encapsulated to make it through the stomach and into the intestines. Here’s to a happy colon! I am on a mission. I am looking for families who want to get rid of the chemicals in their homes. There are so many things we can do to make our homes healthy, safe and toxin free. I know what a difference my family has seen since incorporating health and lifestyle changes. I wish I had known these things when my kids were young; but it's never too late to learn what families can do to be healthier.